A positive user sentiment is an essential factor of App Store Optimization. It is directly influencing visitors in their decisions to download an app or game, thus acting as an important component of conversion rate. Today we will see how to leverage the power of app ratings to your advantage and make the most of positive ratings to drive organic downloads of your app or game. When taking a decision about downloading an app, 90% of users take into account its rating, 79% the reviews and 4 of every 10 people consider the reviews same or even more important as the recommendations from friends. High average rating is at the same time a sign and a key component of app’s success. 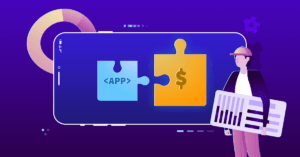 With more than 7,5 million apps in the stores, breaking through the crowd and convincing a user to download is not such an easy task. The top apps and games were found to have at least 4-star rating, both for current version and cumulative. On average, the rating of the top iOS apps is 3,81 stars and for Android it is 4,16 stars. Read more | 7 Lessons from Top 100 Apps: What Does an ASO Optimized App Look Like? The reality is that user ratings really matter. Low ratings can cause a damage to search rankings and affect the overall visibility of an app, not mentioning that the users will not convert on a store listing with a poor rating. The high average rating, instead, will result in better search rankings, more visibility on the stores, more downloads and higher revenues. The right way to react on negative feedback is not to take it personally, but rather treat it as a support ticket. Keep calm – it is impossible to satisfy everyone, so the best you can do is to prevent getting negative ratings and encourage more positive ones. A good moment to start thinking about getting user reviews is… yesterday. At the moment of launch of an app, you can already ask your beta-testers and friends to rate your app so you get a head start at launch. But you should never stop working on user ratings – moreover, because there are relatively easy ways to take care of it. A foremost goal to achieve is to build an app that provides a clear and fundamental value to the users and solves a need. The successful apps have a value proposition that is easy to identify, for example: Skype provides a solution for video calls, Google Maps help find fastest routes to get to places, Facebook Messenger helps reach your friends network in a simple and fast way. Make sure the users understand the value of your product (for example, by providing a clear onboarding sequence). Your app must function well, so update it often, solve bugs and constantly work on improving user experience. 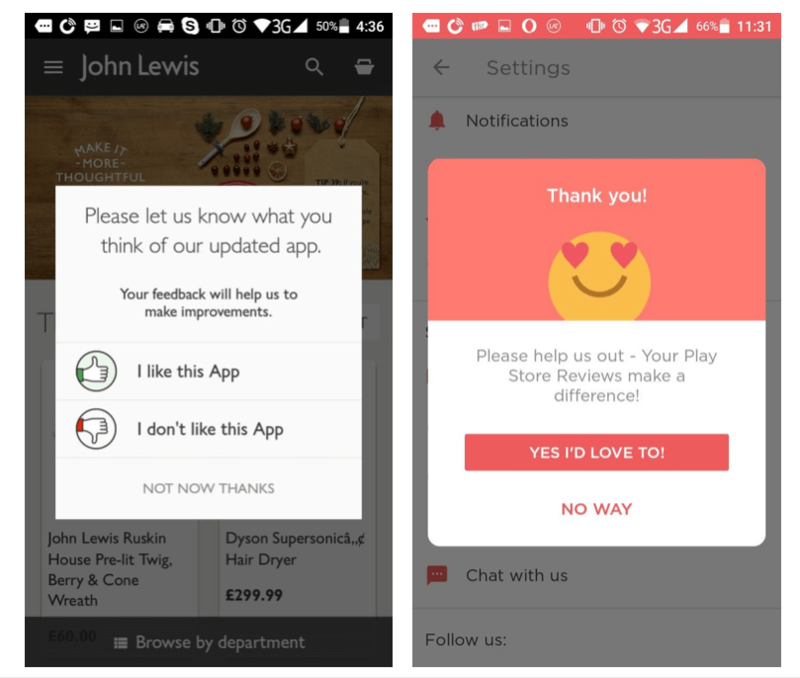 Make your users happy – and positive ratings will follow! Use ratings and reviews as a wake-up call, a trigger to improvement. If you solve a bug that didn’t let your user enjoy the app and caused a negative review, there is always a chance that the user will change his rating. Sometimes negative reviews can have great ideas about new features that you would like to include to your roadmap. Show the user that you understand the inconvenience from their point of view, and try to compensate their bad experience. Providing an excellent customer support can actually make these users change their negative rating to positive! In order to get a significant improvement in search and top charts rankings, an app should have A LOT of ratings and reviews. Don’t expect the users to leave feedback – ask them for it! The biggest mistake the developers usually make is firing app users with pop-us each time they enter the app or game. This looks obsessive and can become quite annoying for the users. No wonder lots of them will end up leaving your app a poor rating. Don’t make the same mistake – ask just the right users and only at the right time. Not everybody who uses your app is happy about it. Some might be bored, experiencing bug problems or other troubles, or be on the edge of uninstalling the app. It goes without saying that you don’t want all these unhappy users to end up on the app store leaving you a low rating. By asking users their opinion first, you ensure negative reviews stay out of your product page, and the users who get to rate you will most likely give you 5 star ratings. Another common mistake of mobile developers is asking users to rate their app just too soon. For most users, short time is not enough to navigate through your app, learn how to use it and start enjoying it. It turns out that if you ask users to rate your app before that special moment, you are more likely to get a negative rating. Finding “that exact point of time” is easier if you know the moments of joy of your users – the times when they are the most happy and excited about using your app or game. The users enjoy feeling helpful and being the part of something big. Remind them how important it is for you to get their feedback, and show the benefits that it can bring to the app or game and even to themselves: more content, updates, new levels, new functionalities or even new products. Addressing only the engaged users to leave feedback is important, but in order to build a strong positive relationship with your users, you need to provide them an excellent customer support. Make sure your users know where to go if they’re experiencing problems with your app. Build a dedicated message center that is easily accessible from inside the app or game – it will save you hours of replying to complaints from unhappy users. This way, you will avoid negative ratings and reviews leaking to your app store page, and the users whose problems you solve previously, will be more likely to leave you a positive feedback in the future. Games get 60% of all the ratings! Guess why? Because they are engaging and motivating people to surpass their goals and strive for more. Try to engage your users to leave a feedback by creating a game around it. For example, offer your users a small prize like a bunch of in-app goods or currency, discount or any other special content. Just keep in mind that both App Store and Google Play have rules about contests and rewards, so check them carefully before you set this up. However straightforward your prompt might be, it is always possible that some of the users won’t have a clear idea what are you asking them to do. Practice shows that developers’ assumptions have little in common with real users behaviour – so the only way to find out if your prompt really works, is A/B testing it. Make a hypothesis and start testing different options of your rating prompt – an action as simple as showing the 5 stars can lead to a significant improvement in response rate and in average rating score. Read a case study of how CallApp managed to increase ratings by 80% and reduce negative feedback by 70% by playing with their call-to-action. Why not ask your existing fans to rate your app? If you have a strong community built around your product, use this power to increase the amount of installs and thus, ratings of your app. Ask your users to rate and review your app through social media accounts and email newsletters. Create a path for social media sharing and make the most of word of mouth marketing. Encouraging your users to share their ratings on social media accounts will help you build trust among the network of these users and thus broaden your audience reach. User feedback is essential to building a successful app marketing strategy. It has a direct impact on App Store Optimization, influencing store ranking algorithms for search and top charts. Moreover, ratings and reviews have a direct impact on app product page visitors and can convince or discourage them to download and try your app or game. This is why it is so important to take care of user ratings and work hard on collecting more, and better user feedback. 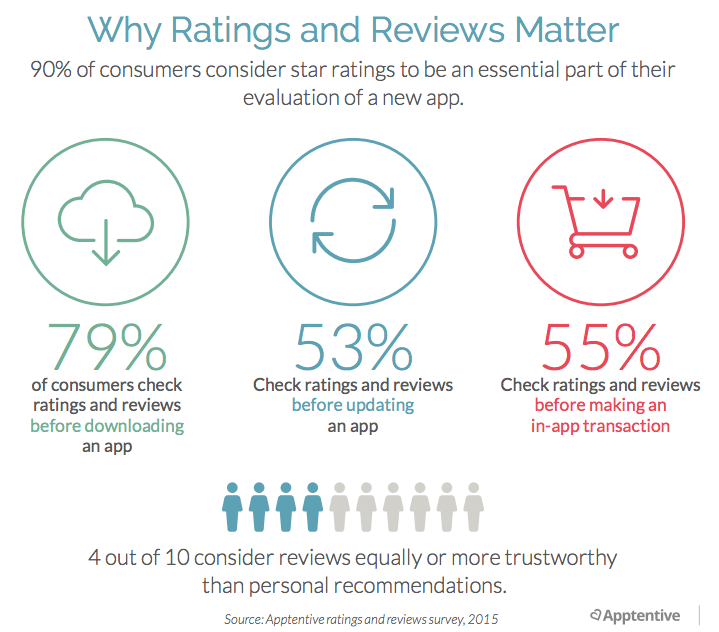 As much as 79% of users check ratings and reviews before downloading an app. Make it impossible for them to resist to try yours! Want more data? Check out the Mobile Apps Ratings and Reviews Report by Apptentive! Awesome, better learning and great prospects. Great article. I already use some of them but I will try other suggestions too. Thanks. Very useful Katerina. One of the areas where we are trying to improve for Mintly is to engage users in giving us more feedback to add value to them.